Thanksgiving is next week! Can you believe it?! Preparing for it will begin in my household this week. Recipes need to be pulled out. There is a shopping list to make. My husband and I are adding on some extra food preparation as God has put before us a family in need. During the next few days, it will be busy in our household. This is the time of year that is so easy to forget to take time to truly be grateful. We find ourselves running around with our to do lists and when we finally sit down to the Thanksgiving table we find it hard to shift our minds into grateful thinking. 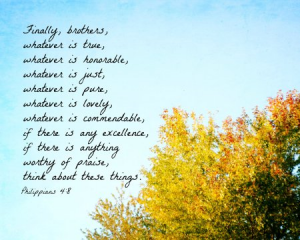 A couple years ago, a wonderful Christian author, Holley Gerth, posted on her blog a list of seven questions, one for each day of the week leading up to Thanksgiving, as a way to intentionally practice gratefulness. Perhaps you would like to use these and enjoy participating in a week of being thankful while preparing for Thanksgiving. You might even want to ask these questions to those around your Thanksgiving table. This is such a great idea for thinking praise worthy thoughts during a busy week of holiday preparation. 1. November 17th – Who in your life are you thankful for? Think of at least one person. 2. November 18th – What is a memory that brings you joy? Look back and see God’s goodness in it all over again. 3. November 19th – How have you seen God answer your prayers this year? Pause and reflect on one “yes” you are living in now. 4. November 20st – When do you feel joy? Pay extra attention to one happy little moment in your day. 5. November 21nd – Where can you see God’s hand in your life? Consider one way He is taking care of you. 6. November 22rd – Why did Jesus come for us? Revisit His extraordinary love. 7. November 23th – Give thanks for all of the above. Have a grace full week of thinking praise worthy thoughts and thanking God for being a good Father. Thank you Kim. Miss you! Wishing you a most blessed Thanksgiving as well.